Upright: Ambitious, action-oriented, driven to succeed, fast-thinking. Reversed: Restless, unfocused, impulsive, burn-out. The Knight of Swords shows a knight dressed in armour, charging ahead with great energy on his powerful white horse. The knight’s sword is held high, a symbol of his dedication to his purpose and mission. The white horse symbolises the purity of the intellectual energy that motivates the knight. In the background, storm clouds are beginning to form, and the trees bend in the strong winds. The wind doesn’t stop the knight, however; he heads directly into it, eager to complete his mission. 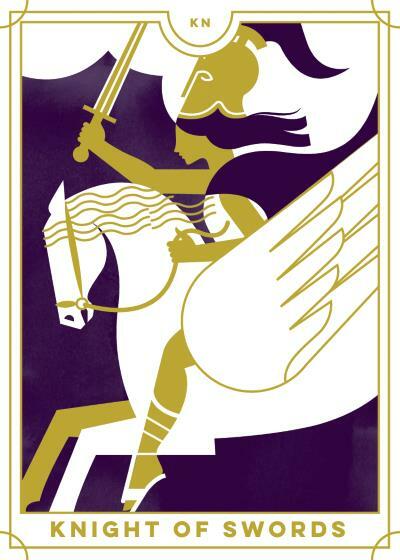 The Knight of Swords reversed can appear in a Tarot reading when you are brimming with energy and motivation but cannot effectively channel and release this energy. You are growing restless and frustrated because you want to take action, but something is holding you back. Perhaps the timing isn’t right, you don’t have enough resources, or you’re relying on someone else who isn’t ready. You need to find alternative ways to release this energy. Otherwise, you are going to burst. Similarly, the Knight of Swords reversed suggests that you have little direction and are making rash and impulsive decisions, pulling others down with you. Your thoughts are scattered, and you are constantly changing your mind. If you are leading others, this can be very confusing and frustrating for all involved. Even if working alone, you may find that your distracting ‘monkey mind’ is getting in the way of your overall success. You may need to apply a single focus; pick an idea and then stick with it until it is complete. It will take mental discipline to see it through – are you up to the task? The reversed Knight of Swords can also suggest that you need to slow down; otherwise, you are at risk of severe burnout and exhaustion. You want to be involved in everything, but you are not succeeding at anything due to this roving energy. As such, you are accomplishing very little and growing more tired by the day. Take some time out so that you can first ground yourself, gather your thoughts and concentrate on only the top priorities. Finally, the Knight of Swords reversed indicates that you need to go it alone to build up valuable life experience and maturity. As you search for freedom and independence, it is likely you will make mistakes on your way due to your reckless and impatient nature, but this is all a part of the journey.